What's that thing you're holding? I get this question every time I play the berimbau in public. Before playing capoeira, I had never heard of it, let alone knew what it looked like. Now playing it is one of my favorite things to do. When I first saw it, I was curious how it worked. There were a lot of parts to it which looked really complex. I decided to buy one, even though I knew nothing about it. I’ve since experienced the actual simplicity of this instrument and discovered its importance in the world of capoeira. In Capoeira, the berimbau is the principle instrument…it leads the way. I’ve learned it’s so important because it sets the pace and style of the game. The speed at which it’s played dictates how fast the players move and respond. A fast tempo and you’ll see a lot of kicks being thrown, while a slower one will lead a more intricate game. It’s not only the speed of play which affects the game. Certain toques or rhythms dictate the style of the game. The Angola rhythm directs a slower game with tighter movements in contrast with the Regional rhythm and its generally more upright play. The berimbau can be a complex instrument. It has many parts which contribute to making it sound the way it does. I’ll break down its different parts and how they relate to the instrument. Verga (Bow) – The verga is the backbone of the instrument. It’s the bow which the wire and gourd attach to. Usually the verga is made from the wood of the berim tree. This is where the instrument gets its name. Arame (Wire) – The arame is the wire that vibrates when hit and makes the unique tones of the instrument. It is strung onto the verga and tightened to get a desired pitch. The arame usually comes from the inside of a tire or a piano. It is twisted into a loop on one end which connects to the bottom of the verga. The other end has a string to tie it to the top. Cabaça (Gourd) – The cabaça is a dried, hollowed out gourd which attaches to the arame and verga. It amplifies the sound coming from the arame. 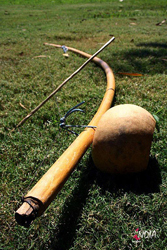 Baqueta (Stick) – The baqueta is what the player uses to strike the arame. This is what makes the sounds. It is usually made from wood. Dobrão (Stone) – The dobrão is what gives variety to the sound of the bow. It is used to create a higher tone when firmly pressed on the arame. It also makes a buzz tone when lightly pressed on the arame. When it’s not touching the arame, a lower tone is produced. Dobrãos are either smooth stones or metal coins. 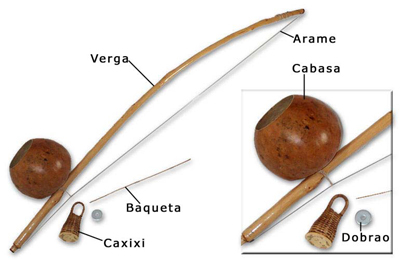 Caxixi (Shaker) – The caxixi makes it own sound when the baqueta is striking the arame. It is a handheld container holding seeds or other small parts which make a shaking sound when played. It is held in the same hand as the baqueta on the middle and ring fingers. These parts all work together to create the unique sounds of this musical bow. The first and most important step in setting it up, is stringing it. As I found out, this is tougher than it sounds. Learn how to string and hold the berimbau here!